As the weather cools, area residents have a chance to enjoy local parks and preserves, some of which are well used requiring attention to meet the needs of its guests, while some are not as well known waiting to be discovered. 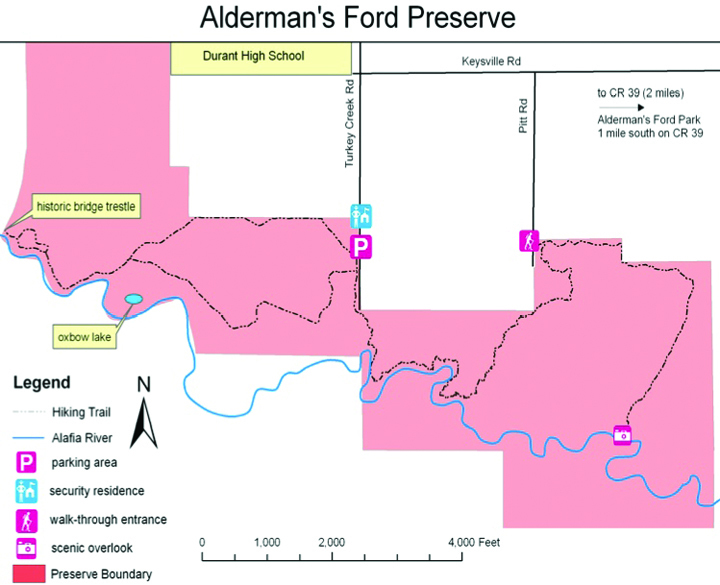 One of these less visited or undiscovered parks includes Alderman’s Ford Nature Preserve, located at 8911 Turkey Creek Rd. about a half mile south of Keysville Rd. The hiking trail entrance of the preserve is on the West side of Turkey Creek Rd., just South of Durant High School. The Preserve consists of 970 acres of natural habitat purchased for preservation under the Hillsborough County Environmental Lands Acquisition and Protection Program and the State of Florida’s Conservation and Recreational Lands Program and is part of a permanently protected riverine wildlife corridor of over 10,000 acres. Open year round during the day, the hiking trail winds for roughly five miles along the banks of the Alafia River. Other stretches of the trail climb away from the river and enter high and dry forests of longleaf pine and live oak while its wildlife includes fish, turtles, alligators, birds, snakes, deer, river otter, bobcat just to name a few. Parking is inside the small entrance on the West side of Turkey Creek (South of the security trailer). Another access point is on Pitt Rd. Facilities, including restrooms, water fountains and picnic shelters, are located at Alderman’s Ford Regional Park’s canoe launch on Thompson Rd. at 100 Alderman’s Ford Park Dr.
To give attention to some of the much-used parks and preserves also, Hillsborough County Parks, Recreation and Conservation Department hosted a public meeting to discuss and seek input for the proposed new location of the Balm-Boyette Scrub Preserve trailhead and parking area. The proposed facility, a favorite for residents who enjoy off road bicycling, is promising to provide a more direct access to the mountain bike trails and will move access from Balm-Boyette Rd. to the North side of C.R. 672. “The public’s use of the preserve has outgrown the small parking area on Balm-Boyette Rd. and parking along the right of way happens on a regular basis,” said Russ Dickerson environmental lands manager for Hillsborough County.